On June 4, the White House announced that President Trump’s planned congratulatory appearance with the Super Bowl champion Philadelphia Eagles was canceled because, it stated, “They disagree with their president because he insists that they proudly stand for the national anthem.” Reporters quickly noted that no Eagle players knelt during the anthem last season. Characteristically refusing to admit error, Trump instead issued a new justification, referencing a policy he had bullied the NFL into adopting for next season, under which anthem protests can take place only in the locker room, out of sight of cameras. “Unfortunately, only a small number of players decided to come, and we canceled the event,” he tweeted. “Staying in the Locker Room for the playing of our National Anthem is as disrespectful to our country as kneeling.” Obviously, no Eagles had yet stayed in the locker room during the anthem, since they would not be forced to make the choice to do so until the fall. His chain of cause and effect made no chronological sense at all. But in Trump’s twisted psyche, the connection made all the sense in the world. Skipping an appearance with Trump was the same thing as skipping the national anthem. Trump is the flag. In lieu of the traditional appearance, Trump promised football fans a celebration of America. It was a sad little display of ersatz patriotism. 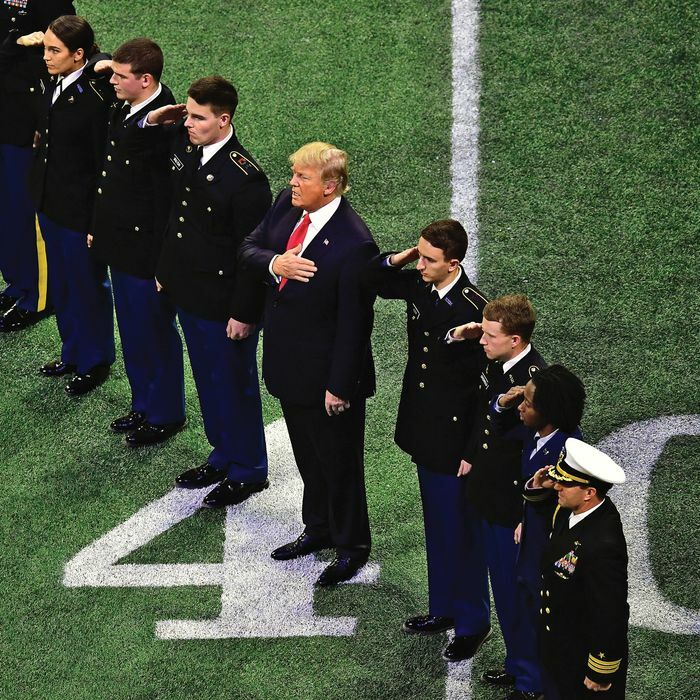 Before an audience of Republican staffers hastily summoned to fill out the crowd, and against a backdrop of a military band and a large flag, the president sang “God Bless America,” or at least the lines he could remember. Patriotism requires subordinating yourself to something larger, and Trump cannot subordinate himself to anything. His idea of patriotism is a kind of trolling — which, to be fair, is also his idea of nearly everything. The performance of authoritarian theater capped several head-spinning days in which Trump laid bare with unusual clarity his determination to put the state at his personal command. In recent weeks, he has fixated on his power to pardon any federal crime. The presidential pardon is a constitutional anomaly of previously minor significance. In the English legal tradition before the framing of the Constitution, kings issued pardons, a necessary safety valve in a legal system with rigid rules and a heavy use of capital punishment. It took Trump to fully exploit its potential for abuse as an enabler of wanton criminality. Trump visibly relishes the ability to use the pardon to reward his allies, whether they be criminals themselves (the brutal lawbreaking sheriff Joe Arpaio, Bush-era perjurer Scooter Libby, or right-wing conspiracy theorist and campaign-finance scofflaw Dinesh D’Souza) or advocates of a potentially deserving subject (Kim Kardashian, whose husband, Kanye West, has emerged as Trump’s most prominent African-American spokesman, persuaded Trump to release 63-year-old nonviolent drug offender Alice Johnson from her mandatory-minimum sentence). It might seem odd that Trump would pardon a drug offender, albeit one who has already served a disproportionately lengthy sentence, given his general support for rigid sentencing for drug offenders (including the death penalty for dealers). But the inconsistency between Trump’s pardons and his overall support for brutal law enforcement is not beside the point. It is the point. Trump is sending the message that the law is whatever he says it is. His friends and potential co-defendants have received the message clearly. The pardoning “has to be a signal to Mike Flynn and Paul Manafort and even Robert S. Mueller III: Indict people for crimes that don’t pertain to Russian collusion and this is what could happen,” Roger Stone told the Washington Post. “The special counsel has awesome powers, as you know, but the president has even more awesome powers.” On The Alex Jones Show, Stone even promised, “I will never roll on Donald Trump,” offering up the quo for the presidential quid. At the same time, any pretense of Trump’s respecting the independence of the Justice Department has disintegrated. Attorney General Jeff Sessions clearly had no choice but to recuse himself from the Russia investigation, given that he played a role in the campaign that is under investigation and misled Congress about his own contacts with Russia. And yet, as obvious as the decision to recuse was to anybody familiar with either DOJ policy in particular or government ethics in general, its logic was entirely lost on Sessions’s boss. Trump attempting to absorb ethics-based reasoning must be like a child in a Peanuts movie listening to an adult, with the words all sounding like indecipherable trombone notes. Trump, reported Axios recently, never stopped berating Sessions for his recusal or gave up his attempts to persuade the attorney general to un-recuse himself (which would be an even more extraordinary move). Trump has tried to sell Sessions on the prospect of becoming a “hero” to their base by quashing the Russia probe and opening new investigations of Trump’s political enemies. “Much of [Trump’s] desire for investigating [Hillary] Clinton and Barack Obama comes from a desire for retribution,” people who have discussed it with him told Axios. The allegation that the president had pressured his attorney general to violate ethics both by reversing his recusal and by halting an investigation into presidential misconduct is a Watergate-level offense. Yet Trump has so numbed the faculties of his critics that the report barely registered. Astonishingly, Trump himself confirmed the report. “The Russian Witch Hunt Hoax continues, all because Jeff Sessions didn’t tell me he was going to recuse himself,” Trump tweeted. “I would have quickly picked someone else. So much time and money wasted, so many lives ruined … and Sessions knew better than most that there was No Collusion!” Trump and his lawyers have asserted that he is immune from indictment — even, Rudy Giuliani insisted, if he were to shoot James Comey — and could, in any case, pardon himself for any crime. Their lack of interest in disguising these claims to complete presidential immunity from the law is a chilling indicator of where the crisis is headed. If Trump tells the FBI to stop investigating him, they have to do it. If he tells them to start investigating his Democratic opponents, they have to do that too. It is hard to imagine how a democratic system could survive under such conditions. Anybody who had predicted when Trump took office that the president’s lawyers would officially proclaim his right to start or stop any federal investigation would have been dismissed as a paranoid worrywart. Trump’s authoritarian doctrine has not been tested by the courts, and seems unlikely to prevail. Still, the fact that it has gotten as far as it has, without producing any serious blowback from his own party, is a measure of how far the peril has advanced. The rule of law in the United States is like a suspension bridge — still upright, but with cables snapping, one by one.